Huda Shaarawi - Who is Huda Shaarawi? A lifelong feminist and nationalist activist who grew up in a wealthy family during the last of the harem years, Huda Shaarawi was born in Minya, Upper Egypy in 1879. Married to her older cousin at the age of 13, she separated from him after little more than a year and did not see him until they reconciled seven years later and had two children, Bathna and Muhammad. When her husband died in 1923, Huda was in a unique position of independence, having no surviving male family members to take care of. She used her considerable wealth and energy to build and support the movement for women’s equality. In 1908, Huda Shaarawi created the first philanthropic society run by Egyptian woman. This society provided social services for poor women and children. Huda considered women-run charities as especially important because they not only gave women an outlet through which they could learn practical knowledge and skills, focusing their energies outside the confines of the home, it also helped change the image of women, showing they could be strong and self-sufficient. Huda also founded the Intellectual Association of Egyptian women in 1914, an organization that began when Marguerite Clement offered to give a lecture for women during a visit to Egypt. Soon, Egyptian women were also giving lectures and the Association was born. In 1923 Huda founded the Egyptian Feminist Union, an organization that promoted women’s suffrage, better education, and changes in personal status laws. She presided over this organization until 1947. Huda was the founding president of the Arab Feminist Union. She spoke at the Ninth Congress of the International Women’s Suffrage Alliance in Rome in May of 1923, however, as her views became more pan-Arab, she distanced herself from the organization. Huda was also a member of the International Alliance of Women for Suffrage and Equal Citizenship, of which she became the vice president in 1935. Huda Shaarawi was equally remarkable as a nationalist activist. In 1919, she led a march of women against the British. She was president of the Wafidist Women’s Central Committee, a committee created to coordinate women’s efforts in the independence movement, from 1920-1924. 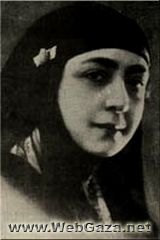 Huda Shaarawi founded two magazines, l’Egyptienne (1925), and al-Misriyya (1937) and supported the founding of al-Mara al-Arabiyya, the newsletter of the Arab Feminist Union. She spoke on women’s issues and concerns throughout the Arab world and Europe.